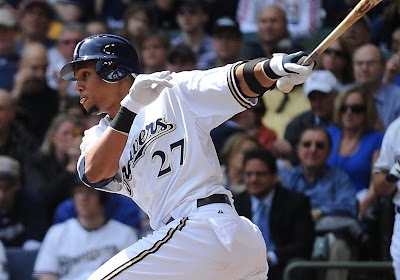 For some reason, Carlos Gomez has recently drawn the ire of more than a few Brewer fans. It may have to do with his .240 batting average, or the 10 double plays he's grounded into (second on the team), or it could be the .364 slugging percentage. But more likely, its his comments that he only needs to be hitting .260 to be considered a good player. But really, it's not his fault. He should have never been put in this position anyways. Let's place the blame squarely on the shoulders of J.J. Hardy, where it belongs. Had Hardy not had such a poor season in 2009, Gomez would never have been on the Brewers this year. If he had played to the level of even an average offensive player the value Milwaukee received back would have been astronomically better. If you compare their stats this year, Hardy and Gomez are pretty much a push. Actually, Gomez leads Hardy in every offensive category except for doubles and batting average. Both have spent time on the disabled list, although Hardy has never really been challenged for playing time by any other players. Just think, he could have torn it up and landed the Brewers a starting pitcher. That would mean Chris Narveson would never have had the chance to pitch as poorly as he has. Or Doug Davis and his 7.51 ERA might never have been signed. So in a way, the Brewers pitching deficiency can be blamed on Hardy too. Had the Brewers not been *forced* to give up their one-time all star shortstop for Gomez, then we would likely have seen top prospect Lorenzo Cain earlier, whether he was ready or not. Or Milwaukee could have pursued a free agent like Rick Ankiel for $3.25 million, or Coco Crisp for $5.25 million. That's not money that could have been better spent anywhere else. No, when your frustration at Carlos Gomez starts to mount, think carefully. Is it really his fault? When he strikes out don't throw things and shout about how bad he is. When his approach at the plate insults even the most casual fan - remember - it's not his fault. When he loses his starting spot to Lorenzo Cain and is moved to an exclusively backup role and fans continue to be disappointed that all their former star could bring back was a pinch-runner and fourth outfielder, don't blame Carlos Gomez.